I’m frustrated with the amount of salt that people throw around the minute the temperature even begins to approach 0°C, regardless of whether or not the weather means ice. It often seems that Victoria is single-handedly trying to resalinate the world’s oceans. “A comprehensive five-year scientific assessment by Environment Canada determined that in sufficient concentrations, road salts pose a risk to plants, animals and the aquatic environment. From this, they developed a code of practice… this was in 1999, people. The handy table below outlines characteristics, chemical contents and environmental impact of different types of salt, as well as sand and urea. It can be found on Hamilton, Ontario’s Green Venture site (somewhat legitimate as the board of directors weighs heavy on the science side, and they’re funded on a governmental, community and corporate basis). I’m pretty sure most people will agree with me when I say that the amount of salt used here has reached obnoxiously paranoid levels. The following pictures were taken at 1309 Cook Street. I was unable to track down the managers or maintenance for that building so I couldn’t find out what kind of salt(s) they’re using. 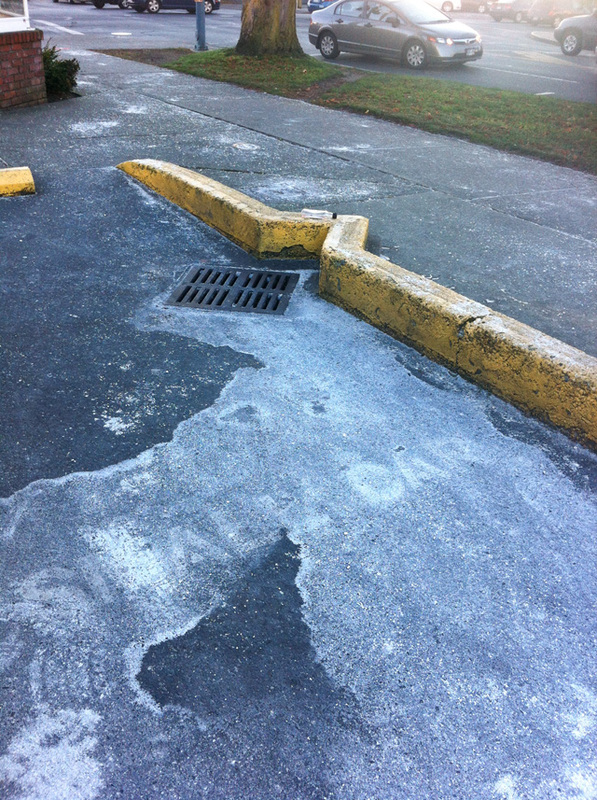 You’ll note a trail of dissolved salt leading to the drain as well as a big pile of loose salt. 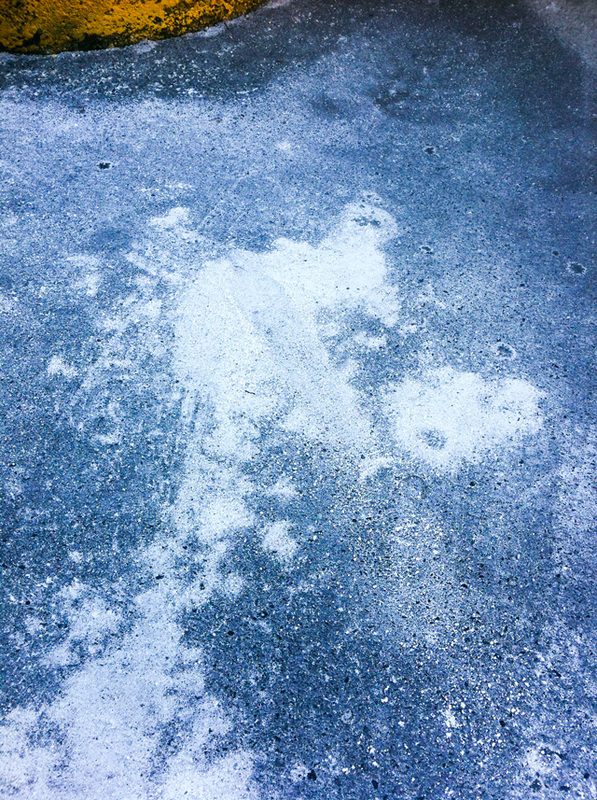 I’m pretty sure loose salt on dry tarmac is going to decrease as opposed to increase friction. Jawl Properties isn’t much better. They manage (and own?) a large number of properties all over town, especially at Selkirk Waterfront. When I called, they tried to be helpful, but this was the response: “we use three different types of salt, one of them is organic. We don’t know which is used at any individual location because it gets distributed in buckets.” Way to be aware and accountable. 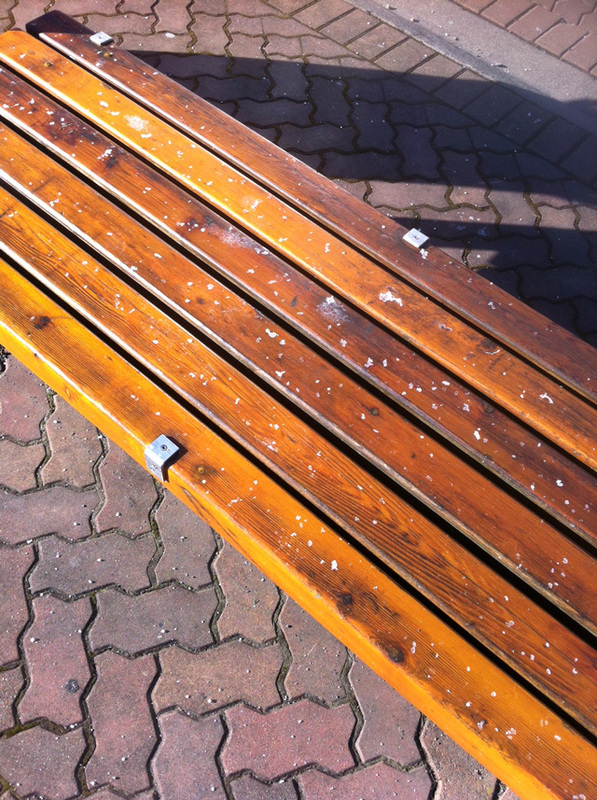 I’m sure glad that on a dry and sunny day Selkirk Waterfront benches may have been de-iced with organic salt. But they still coat their lots with the stuff when there’s no ice. Shame, shame. C’mon people, salt is for when there’s ice, a lot of ice, not when there might, at some point, maybe be a little bit of ice. Use it safely and responsibly.